Las Vegas is finally big league when it comes to professional sports. The National Hockey League Board of Governors voted Wednesday to grant Las Vegas an expansion franchise that will begin play in the 2017-18 season at T-Mobile Arena, becoming the city’s first team in one of the four major pro sports. The Foley/Maloof Sports & Entertainment, LLC ownership group agreed to pay a $500 million entrance fee for the yet unnamed team that will debut in the 100th season of the NHL. 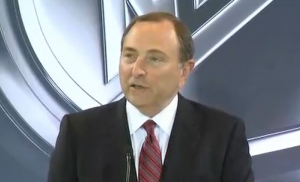 Bettman said the Las Vegas expansion vote was unanimous. Each NHL team will reap $16.6 million from the expansion fee. Here’s the official release from the NHL announcing the expansion that also includes information on the expansion draft, league alignment and scheduling. LAS VEGAS (June 22, 2016) – The National Hockey League announced today that it has granted an expansion franchise to Las Vegas. The franchise, which will begin play in 2017-18, was approved in a unanimous vote by the League’s Board of Governors during a meeting today in Las Vegas. 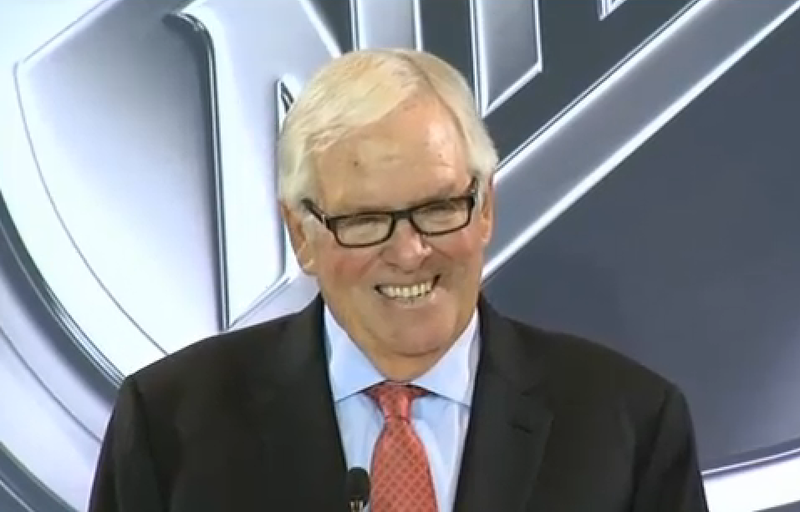 Ownership of the Las Vegas franchise will principally reside with Bill Foley. The franchise will play its home games in the recently opened, state-of-the-art T-Mobile Arena, which has a hockey capacity of 17,368. The Las Vegas franchise will pay a $500-million expansion fee. That fee then will be distributed in equal shares to each of the NHL’s 30 presently existing clubs. This marks the first League expansion since 1997, when the NHL added four franchises – Nashville (1998-99), Atlanta (1999-00), Columbus and Minnesota (2000-01) – at a franchise fee of $80 million. The NHL also announced that is has deferred the expansion application by Quebecor and its ownership group in Quebec City. Although the League sees Quebec City as a prime opportunity for future expansion, the Board of Governors concluded that the NHL’s lack of geographic balance, the belief that it would be best not to assimilate multiple teams into the League at this time, as well as the recent and significant devaluation of the Canadian dollar made it prudent to defer Quebecor’s application. The Las Vegas franchise will begin play in the Pacific Division of the Western Conference in 2017-18. There will be no other changes to the NHL’s alignment. The NHL’s current playoff format will not change. * All players who have currently effective and continuing “No Movement” clauses at the time of the Expansion Draft (and who to decline to waive such clauses) must be protected (and will be counted toward their club’s applicable protection limits). * All first- and second-year professionals, as well as all unsigned draft choices, will be exempt from selection (and will not be counted toward their club’s applicable protection limits). * Players with potential career-ending injuries who have missed more than the previous 60 consecutive games (or who otherwise have been confirmed to have a career- threatening injury) may not be used to satisfy a club’s player exposure requirements, unless approval is received from the NHL. Such players also may be deemed exempt from selection by the League. * The Las Vegas franchise must select players with an aggregate Expansion Draft value that is between 60-100% of the prior season’s upper limit for the salary cap. The 30 NHL clubs must submit their Protected Lists by 5:00 p.m. ET on Saturday, June 17, 2017. The Las Vegas franchise must submit its Expansion Draft selections by 5:00 p.m. ET on June 20. The announcement of their selections will be made on June 21. The Las Vegas franchise will be given the same odds in the 2017 NHL Draft Lottery as the team finishing with the third-fewest points during the 2016-17 regular season. The Las Vegas franchise’s First Round selection in the 2017 NHL Draft will be determined in accordance with the 2017 NHL Draft Lottery and, as a result, the Las Vegas franchise will be guaranteed no lower than the sixth overall selection. The Las Vegas franchise then will select third in each subsequent round of the 2017 NHL Draft (subject to trades and other potential player transactions).